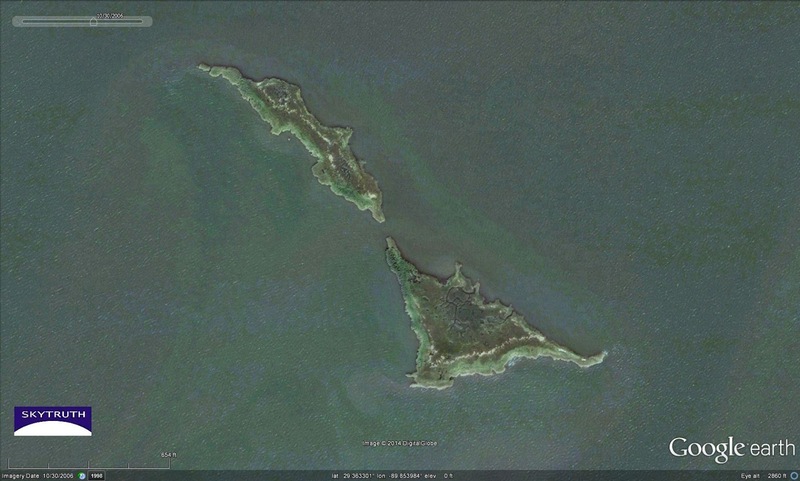 Gulf Coast Islands: Now You See ‘Em, Now You…?? Four years have passed since the BP Oil and Gas Disaster began in the Gulf of Mexico. Some of the lasting damage from that spill is just becoming apparent. One possibility: the acceleration of wetlands loss and coastal erosion due to the die-off of marsh vegetation. 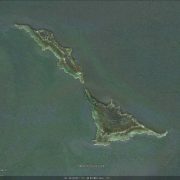 The small, isolated islands that dot the bays are most vulnerable. Like much of the Mississippi Delta region, natural subsidence compounded by sea-level rise and the fragmentation of marshland by oil and gas activity was threatening their existence before BP’s oil washed in. But the spill-related loss of vegetation may have hastened this decline. Densely vegetated islands in Barataria Bay in 2006. 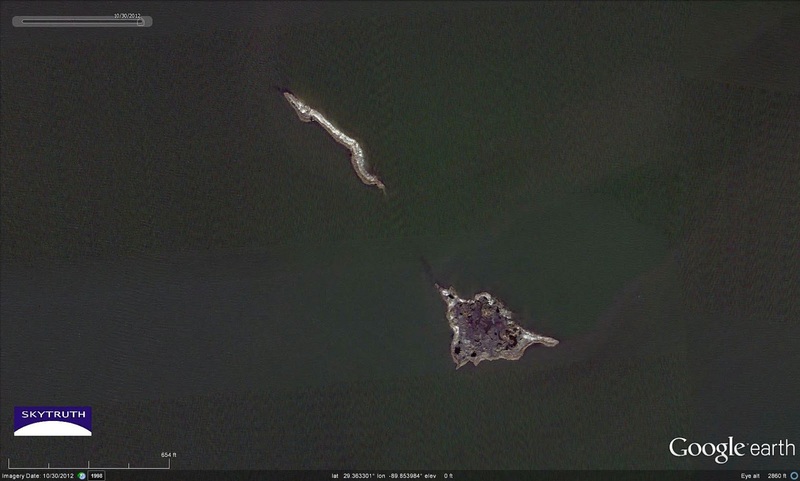 Same islands in 2010 during the BP oil spill, encircled by booms in an attempt to deflect the oil. Same islands in 2012, noticeably diminished in size and apparently lacking vegetation. https://skytruth.org/wp-content/uploads/2014/04/SkyTruth-CatBayLA-GE-2006.jpg 961 1600 John Amos /wp-content/uploads/2016/08/test_logo.png John Amos2014-04-24 20:18:002019-02-14 10:52:03Gulf Coast Islands: Now You See 'Em, Now You...?? Here at SkyTruth we wanted to get on the Throw-Back-Thursday (#TBT) bandwagon, and thought what better way than with a global Timelapse!? This Google-powered tool allows us to see composite Landsat images of anywhere on earth from 1984 – 2012. This amazing time-machine helps us better understand growth, change, development or destruction. Today we’re checking out the urban development around Doha, the capital of Qatar. What you can see in this 28 year span is some HUGE growth happening off the coast and out into the Persian Gulf. By default you’ll see it in “Fast” mode, but go ahead and click that button to slow down to “Medium” speed. 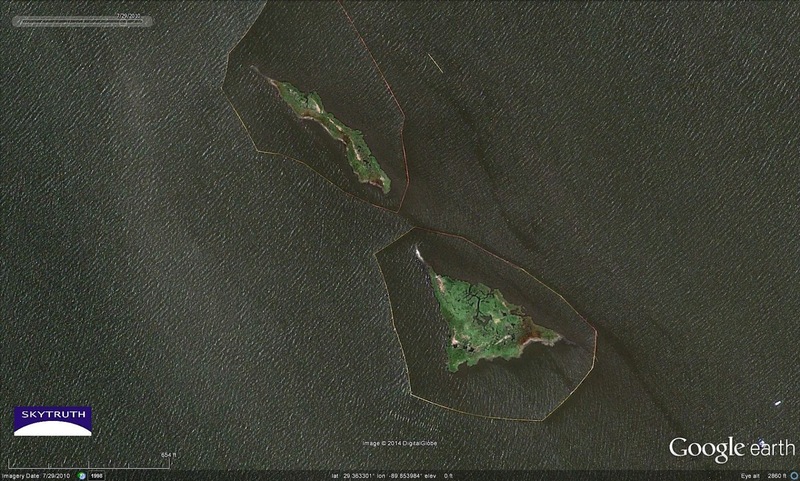 You can also zoom in and check out those man-made islands that bloom off the coast. If you check out the Timelapse homepage you may see similar landmasses appear off of Dubai. We’re beginning to think that plant-shaped islands are the hottest new building craze of the mid-2000’s. THOUGH if you zoom in close on Qatar you’ll see that one of the little “blooms” gets darker than the others right around 2010. It’s the only one so far with any development, but one of the furthest from that golf course that pops up in the desert)! It seems they’re rolling along with infrastructure investments and gearing up for World Cup 2022. Zoom out and explore the world! The Timelapse project was launched by Google in 2013 as a global, interactive map that uses three decades of Landsat imagery to show our ever-changing world. Check out Time’s “Explore the World” option and do some skytruthing of your own! Not only is there new high-resolution aerial survey photography available for Pennsylvania — allowing us to begin a major update to our ongoing FrackFinder project — there is also 2013 imagery now in Google Earth for the Shepherdstown area, so we can take a look at some of the changes that have happened in our own neighborhood since the previous aerial imagery was taken. 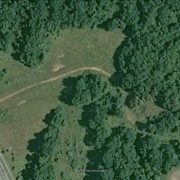 Here’s one thing that caught my eye: some tree-clearing and what appears to be fill activity taking place in a wooded area on the southwest side of town (see it in Google Maps). Anyone know if a permit has been issued for this work? 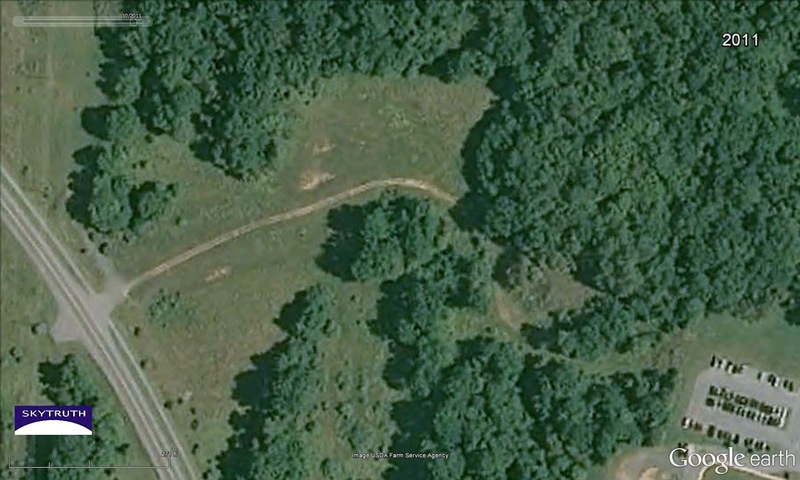 Wooded area on the southwest side of Shepherdstown as it appeared on 2011 aerial photography in Google Earth. Route 480 bypass is highway at lower left; parking lot for Clarion Hotel is at lower right. Same area in 2013. Cleared land is light brown. Apparent fill, in formerly wooded area, is darker brown. About 1.3 acres of trees have been cleared. A yellow bulldozer and another construction vehicle are visible at center. 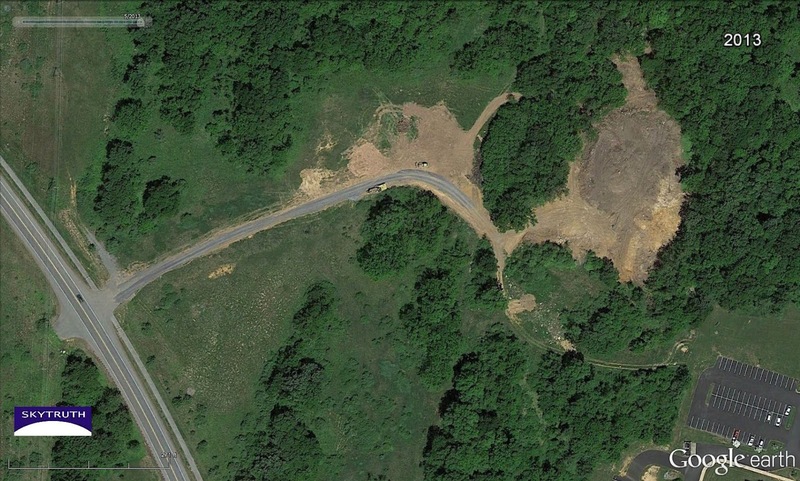 2013 imagery from Google Earth showing Potomac Farms mulching operation along the Route 480 bypass west of Shepherdstown. 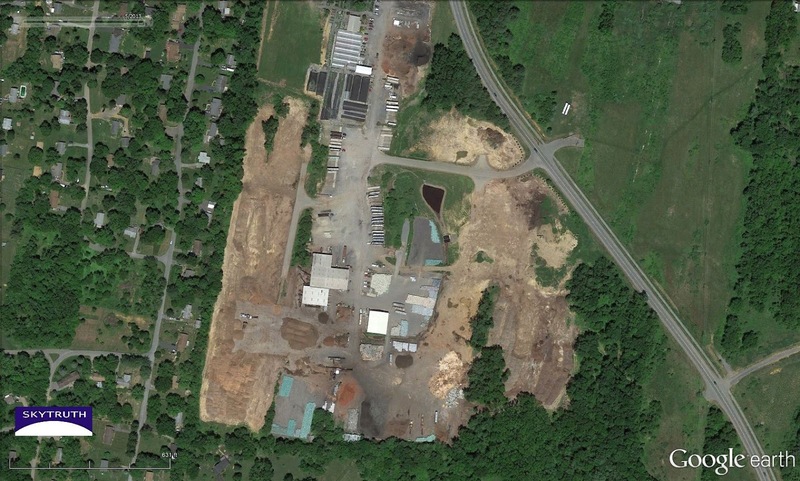 The 2013 imagery for this site is not yet available in Google Maps, which still displays 2010 imagery for most of the mulch operation. So do yourself a favor and get Google Earth, so you can see the latest imagery, toggle back through historical images, make exact measurements of the distances between places, and make your own custom maps. And if you see anything else interesting in our area, please let us know! 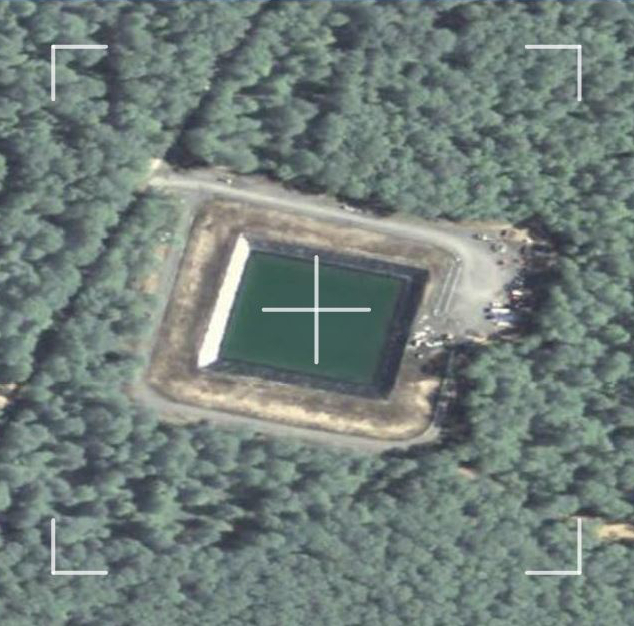 Thanks to all our great skytruthers who helped us find all the ponds that look like this! Thanks to all of our FrackFinders– Project Dart Frog is complete! Many thanks to all of our volunteers for helping us get through this phase of the FrackFinder PA project. 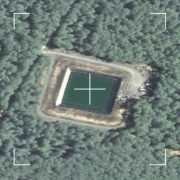 We had over 250 registered users power through 7,835 images to help us figure out if the ponds they saw in aerial imagery were related to fracking or not. Now if 7,835 images sounds like a lot, consider this. Because we really like accuracy, those images were viewed by 10 different sets of eyes. That means our 250 frackfinders looked at 78,350 images! If it wasn’t for YOUR help, our small team at SkyTruth headquarters would still be toiling through imagery. Ready? Just hit this button, sign up (or sign back in), and off you go! Just to recap for you, FrackFinder PA is a multi-phase effort to map drilling and hydraulic fracturing across Pennsylvania using crowd-sourced image analysis of satellite and aerial imagery. Ultimately, these projects will create a comprehensive, public map of drilling and fracking in Pennsylvania. After Pennsylvania, our goal is to create this map for the entire United States. You may also be thinking, “I don’t live in Pennsylvania. I can’t possibly help.” FrackFinder is not a boots-on-the-ground type mission, you can do this from the comfort of your own home, anywhere in the world. We like to think of skytruthing as a sort of “armchair citizen science” that can have a really powerful contribution to our understanding of issues like fracking. As you probably know, the results from our FrackFinder projects are informing a Johns Hopkins University study on the public health impacts of drilling and fracking. Thanks to you we’ve already delivered two unique datasets to them that would not have been possible without you. So check out FrackFinder PA – Project Tadpole 2013 and keep on skytruthing!